Usagi's constant companion and foster child. He is a young boy who looks to be between six to eight years old, although he seems somewhat more skilled in every day tasks than Usagi, even helping her to get dressed. 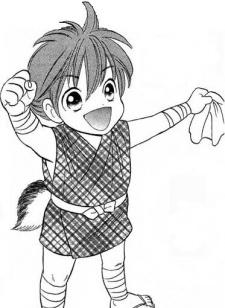 When Mamezo was a baby, he was found by Usagi's dog, Shiro, and it is believed by Hanzō that Mamezo's fear of dogs stems from this incident. Later on it seems that Mamezo's deepest wish is to have Usagi as his mother and to have Hanzō as his father. Eventually, Mamezo encounters his real parents who reject him, as his father tries to force him to forget his past and his mother states that she cannot love him as much as she loves his baby brother, thus making Mamezo permanetly cut ties with them. Mamezo's grandfather entrusts him to Usagi's care after knowing that Mamezo can never become a court noble. Mamezo later becomes engaged to his childhood friend, Watari and becomes a skillful shinobi ninja.